It's been thirteen years since Ottawa, Ontario's The Creeps released their first full length album. Like many pop punk bands getting a start at that time, they fell into similar trappings of writing songs about girls, aliens, UFOs and spies. A few years in, a recurring theme of death and murder entered into their body of songs. It was a theme they held onto for many years and perfected over time. The theme was conveyed through their songs so well that it honestly had me wondering what was really running through their minds. Murder? Or just having some fun within the confines genre? Not only did the band perfect the stalker turned murderer theme in lyric, they became incredibly proficient at crafting killer hooks and infectious melodies. Love or hate the subject matter, the music could not be denied. Add to that the strengthening and development of one of the greatest and most recognizable vocalist in punk rock and you've got the elements of a perfect storm forming. Fast forward to present day. Seven years since the release of their last full length album. 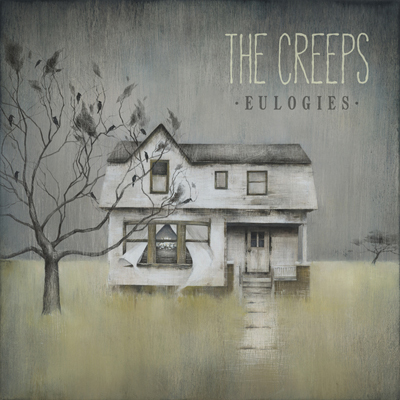 The Creeps are back with Eulogies, their fifth full-length album and first on It's Alive Records. Ten tracks of melodic pop punk perfected. All parts are now in place. The perfect storm is raging. The theme of death still remains at the center of the songs, but it has changed. The feelings of anger and despair no longer manifest as murder. They have turned inward and taken on the form of suicide. Eulogies are not sung to celebrate the memory of your victims, they are being sung for you. The songs of Eulogies are so well written they rose genuine concern within me for the author - my friend. Is this really just a run at a new theme to work with, or should I be worried for my friend? I picked up the phone and called. There is a special kind of beauty within each tragedy. Hold on. Reach out. Let go. No matter how it plays out, in the end you are free from the struggle and the pain.